Hi there! I am Samanyou Garg. I am a final year computer science student at the University of Manchester, looking to secure a Graduate Software Developer position to further develop my skills and knowledge in a practical and fast-paced environment. I am passionate about Artificial Intelligence, Data Science and Machine Learning and love dreaming, designing and reinventing innovate products to make the world work better. Bash, Jupyter, Microsoft Office, Latex, IntelliJ, Atom, Eclipse, Sublime Text, Docker, MySQL, Postgres, Redis, Apache, Nginx, Shell. AWS, Google Cloud, Heroku, DigitalOcean. Bhagavad Gita is a 700-verse Hindu scripture in Sanskrit and is universally regarded as the single most influential philosophical text that provides an ultimate guide to self-realization. 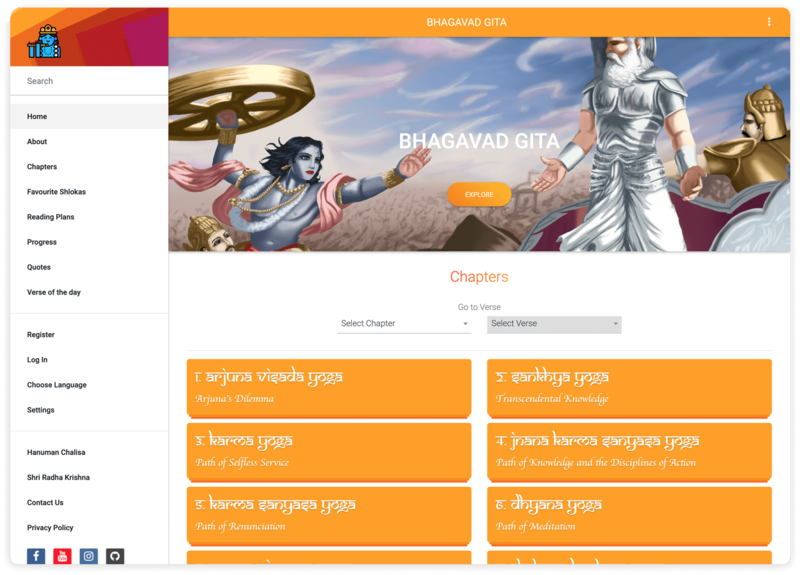 BhagavadGita.io is modern Gita app with a simple, beautiful and easy to use interface, helping users focus on reading. It perfectly combines an intuitive, user-friendly design with best-in-class features to greatly enhance the experience of its users. • Progressive Web App (One of the earliest adapters of PWA) • Android App • Material Design • Translations in multiple languages • Google/Facebook/Github login • Progress Tracking using graphs and detailed statistics • Customized Reading Plans • Achievements System to reward its users. Example API in Flask that follows REST API Best Practices. 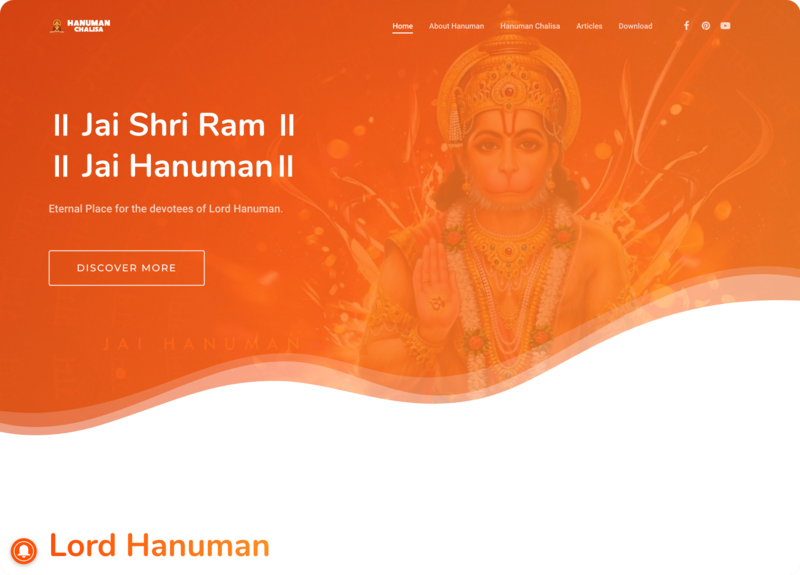 Online portal for the devotees of Hindu God, Lord Hanuman to stay devoted to Him by reading, chanting and singing His prayers, mantras and bhajans. • Ranked on Google Page 1 for the top keywords on this topic. • Progressive Web App. • AMP enabled for instant page loading. Cloud based android wallpaper app providing users custom made, unique and innovative wallpapers of all variety on a single platform. • Tested, debugged, built, developed and deployed a multi-user, multi-threaded, client-server open source game containing over 6000 Java classes and 1800 test cases using Eclipse, Git, Apache Ant, Jenkins, Junit and SonarQube. • Worked on the automation of builds and tests leading a team of 6 people over 12 weeks. EventLite - Event Management Made Simple. • Developed software from first principles to create a new web application using the Spring web framework as a team of 5 people over 10 weeks. • Introduced to MVC system architecture with Spring. • Started by creating User Interface Mockups for the initial requirements given. • Designed for Testability. Constructed good automated tests from requirements, looking in particular at the importance of working out how to ensure coverage, ensuring that functionality can be tested in isolation. • Integrated Third-Party APIs like Twitter and Google Maps API to use their services in our application. • Ensured that acceptance tests are met, and the user experience is good. • Implemented a REST API to enable sharing of data between applications. Automatically selected potential donors based on business rules. Emailed respective people(donors, admins, health center staff etc.) with information and calendar invites. Generated barcode labels for tubes. Detailed request and donor reports. Request tracking using statuses and donor tracking using statuses/barcodes. Worked on any device, taking advantage of any features available on the user’s device and browser. Felt like a mobile app with app-style interactions. Served via HTTPS ensuring that the content was securely delivered. Allowed users to install the web app as a native iOS/android app on their home screen. Allowed users to take pictures directly from their phones/tablets. The Android app used a WebView to create a wrapper around the web application along with Android's Native elements, allowing a user to access their device's hardware to take pictures and videos. Also, helped make the app maintainable as just the code for the web application needed to be updated when a change was required. Connected lab equipment that needed monitoring to the network via Raspberry Pis. Created a web application that allowed the chemists to set up a schedule and an interval (for each data point that needed to be captured) at the start of their experiments. The web application would fire commands at the instrument and grab data at specified time intervals, till it reached the end of the schedule. Detailed custom reports for captured data. Developed a Flask based web application to allow the registration and flagging of chemical compounds. Customized reports generation in multiple formats. REST API to allow the bulk registration, flagging and updating of chemical compounds. Developed a sample end-to-end REST API in Python. Set company standards for developing REST APIs that followed the Best Practices like versioning, validation, meaning HTTP responses, SSL etc. Developed a web application to automate the workflow of filling paper Risk Assessment forms by chemists when starting a new experiment. Well-designed UI to accommodate lots of dynamic form fields inside a page. Form review and sign-off process. Batch form sign-off feature to review and sign multiple forms at once. Built a REST API allowing web applications to interact with the server embedded in barcode scanners using python's socket library. Worked on a genetics and genomics data platform using Flask and Elasticsearch as the backend and AngularJS as the frontend. Set up multiple AWS instances from scratch, installing and configuring Elasticsearch, PostgreSQL, Node, flask etc. Downloaded, cleaned and integrated big data from multiple sources for target identification and prioritization. Created data analysis and visualizations using tools like pandas, json, D3, numpy etc.